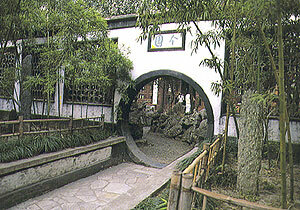 Geyuan in the eastern part of the city is a well-known classical garden in Yangzhou. It was first built during the Ming Dynasty. During the period from the Jiaqing Reign to the Daoguang Reign of the Qing Dynasty, Salt Distribution Commissioner Huang Zhiyun rebuilt the garden on its ruins. Composite rockwork, beautified with chambers, pavilions and kiosks, occupies two thirds of the garden's space. Rocks of different hues and shapes are employed to represent scenes of four seasons. Hence the name of the rockwork: Artificial Mountain of Four Seasons. A stroll through this rockwork evokes the impression that one is travelling through all four seasons of the year. The construction style of the Geyuan Garden is redolent in the conceptions of the northern and southern schools of traditional Chinese painting. The artificial mountain is a nice place for an outing in spring; is a feast to eye in summer; invites visitors for a climb in autumn; and looks like a suitable dwelling in winter. No other garden in Yangzhou matches the Geyuan Garden in distinct local flavor.